Sign up for our weekly newsletter! Every Tuesday, we send out upcoming information so you don't miss a thing. From giveaways to updates, events to weekly deals, this newsletter will bring you up to speed on what's happening around Little Rock AFB! You can always check out the Rockin' Rundown here! Stay in the know with this weekly update of Little Rock AFB events, deals and contests delivered right to your inbox! Our bi-monthly magazine is a great way to get your hands on future events and read up on all things FSS! Inside you will find calendars and a directory, along with detailed information on events and activities, promotions and so much more. It's absolutely free and available for you to pick up in any of our FSS facilities. Unable to snag a copy? You can view the digital version here! It's easier than ever to stay up-to-date with our facilities! For more links to LRAFB, check out the sections below! 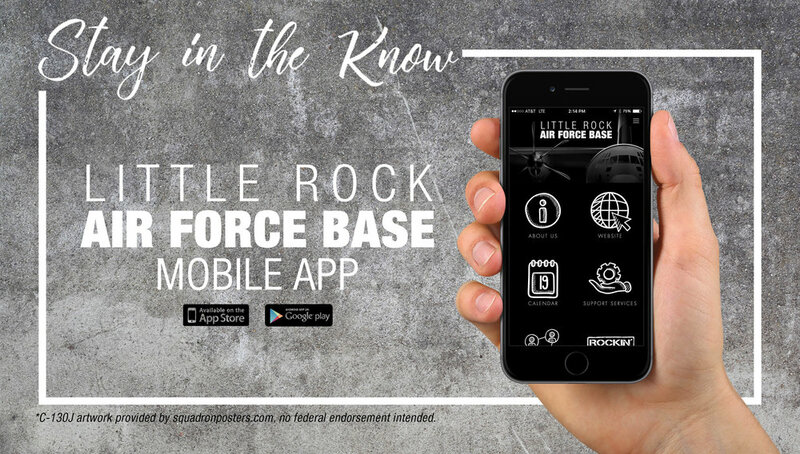 We are so excited to introduce the Little Rock Air Force Base App! If you're looking for everything all-in-one, this is app-solutely the thing you need! Search through the entire base directory, link yourself to important websites, find hours and locations of buildings on base, and notifications sent directly to your phone. The notifications will alert you if there are weather delays, emergency information, and more. Download the app today for your phone and tablet -- just search "Little Rock Air Force Base" in the Google Play store for Android or App Store for Apple! Check out some of these other websites and Facebook links to some popular pages!